Jeffrey Miller was mowing his lawn one day when he came under attack by a scourge of hungry mosquitoes. These skeeters are eaters! he thought as he did the mosquito slap and shuffle. That first rhyming line grew into a complete poem. For years, he held onto his Skeeters story. When Jeffrey met Brandy he recited Skeeters and she encouraged him to turn this whimsical poem into a children’s book everyone could enjoy (and of course they fell in love!). Brandy and Jeffrey got married, and started the process of growing their family through adoption. As the Millers discovered how limiting the cost of adoption can be, publishing Skeeters became more than a personal project. With the help of local illustrator Dale Herron and Columbus Publishing Lab, Skeeters would become not only a beautiful children’s book, but the perfect vehicle to help Jeffrey and Brandy raise funds to support their own journey, and other couples seeking adoptions. 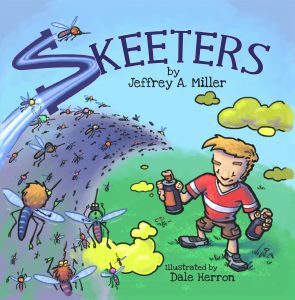 Our first role in publishing the Skeeters book was to help Jeffrey and Brandy get their Kickstarter campaign off the ground and gaining traction. We produced, shot and edited their Kickstarter video, answering questions about crowdfunding promotion along the way. By the time their campaign closed, Brandy and Jeffrey exceeded their goal and raised over $8,000 for their cause! Check out the Millers’ archived Kickstarter campaign here, and watch them tell their story in their own words. After Brandy and Jeffrey’s campaign closed it was go-time. Kickstarter backers were expecting paperback, hardback and e-book versions of Skeeters, and Columbus Publishing Lab was ready to come through. We worked with Dale, the Millers’ illustrator, to ensure the Skeeters files were up to spec for our printer, checking elements like bleed, spine and formatting. We also provided an ISBN and barcode for each version of the book, and created an e-book version from the provided print files. As soon as the files were ready, we uploaded Skeeters to our printer. Jeffrey and Brandy were able to print book copies at a significant discount off the list price to fulfill their Kickstarter orders. Through our distribution services, the book is also available to all major online retailers in a seamless process that’s completely hands-off for Brandy and Jeff. Learn more about printing and distribution through Columbus Publishing Lab here. Backyard mosquito champions all over the world can now easily find and purchase Skeeters and enjoy this beautifully-produced tale in their own home. Check out the paperback, hardback and e-book versions of Skeeters on Amazon here. Throughout the entire publishing process Jeffrey and Brandy had a dedicated point of contact at Columbus Publishing Lab. We were there to answer questions, guide their illustrator, and provide them with the information and expertise they needed to stay in the loop about the Skeeters project. Congratulations to Jeffrey and Brandy on the successful release of Skeeters! We love supporting authors, especially when their work has a meaningful guiding force behind it. Isn’t it time your book became a reality? Contact us to learn more about publishing by clicking here.